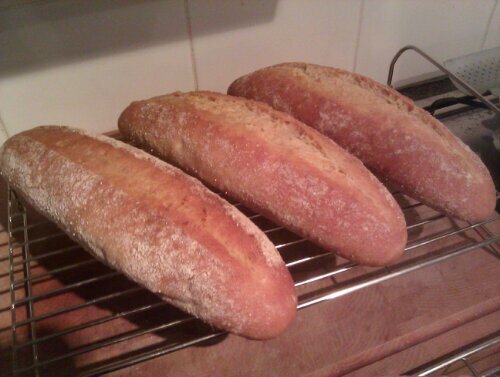 As I needed to make some bread, I thought it would be a good excuse to try out a couple of my Christmas presents: a baguette tray and an oval banetton. Rather than being fancy with the ingredients, I just used a straightforward dough: strong white flour, yeast, salt, and water. Doesn’t get much simpler than that. Mix, knead, rise and knock-back a couple of times, then split the dough: half for the banetton, three sixths for the baguettes. The baguettes were formed by just flattening and rolling up the dough. I wasn’t sure what the best way to form the bread for the banetton, so I went for the ‘stubby cylinder’ method from the River Cottage bread book: flatten, roll up, flatten, fold by thirds and flatten to a square, then roll up again. Everything got a nice coating of rye flour, then left to prove before having the tops slashed and placed in the oven. 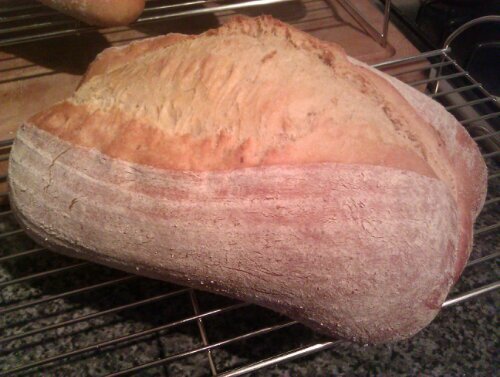 The results look pretty good, although I think I need more (or possibly deeper) cuts, especially for the loaf from the banetton. Not bad for the first go, though! I already had my clothes ready and my bag packed to save disturbing Clare any more than necessary; all I had to do was make coffee to fill two insulated mugs and I was out the door at 4 o’clock to get a lift up to Druridge Bay. Unsurprisingly, there wasn’t much traffic at that time in the morning, and we had a clear run up to the car park at Druridge Bay Visitor Centre, where we were meant to meet up with other people and get into as few cars as possible. Unfortunately, the original instructions we’d received weren’t very clear about how this was meant to be organised, and nobody was there to encourage people to just get on with it, so there was a lot of standing around shrugging until somebody took the initiative. This did give us a chance to have a chat with a few people, including a couple of girls who’d driven all the way up from Brighton, having left at 5 p.m. the previous day and stopped for just an hour-and-a-half’s kip in some services. Absolutely mad! As we knew the way to where we were going, we said we’d lead a small convoy… unfortunately the rest of the convoy pulled out of the car park in front of us, headed the right way to start with, then turned off the main road too early, and didn’t get to the destination until twenty minutes after us. We parked up near our usual spot at Druridge Bay. The first challenge was finding the footpath from the road through the grass and the dunes, not so easy when the sun hasn’t even thought about rising yet. When we got to the beach, there was a bit more activity, but still a lot of standing around to be done while the “registration area” got itself organised. As seems to be compulsory for any event relating to the equinox, some hippy-ish guy turned up with a drum and started banging away at it… a bit of a distraction for a short while, but soon got annoying as there wasn’t much variation in what he was playing, and it seemed to be the drum variation of a funeral march. We could tell things were starting to come together when we unexpectedly found ourselves to be part of a queue, by accidentally standing too close to the registration shelter. Of course, once other people noticed there was a queue, they came and joined it too, even though neither they nor we had any idea what the queue was for… how very British. Eventually we discovered that the queue was to sign the safety disclaimer, which we didn’t need to do anyway as we’d already registered. We had a wander around on the beach to assess the incoming tide, all the while hunching up in our coats against the cold, with the temperature only a few degrees above freezing. Fortunately it was almost high tide; the beach at Druridge Bay has a very shallow slope, and the low tide mark is a long way out. Eventually we all got herded into one group by Jax, the organiser, so that we could march in single-file and be counted accurately, on the off-chance that there’d be enough of us to break the world record (in short: no). There were some numbered posts stuck in the sand, to make it easier to remember where you’d left your stuff, so we headed for the furthest away one to get a bit more space, and more importantly to get away from that damn drummer. By this time there were already some people in the water: two hardy surfers were trying to take advantage of the half-decent waves, and were probably quite surprised to encounter a couple of hundred people when they thought they’d have the beach to themselves. Some more waiting around ensued, as we waited for some stragglers who underestimated how long it would take to walk along the beach, then we were lead in some warm-up exercises to fend off the cold. It’s not easy doing star-jumps on loose sand! Then, with the rising sun trying to force its way through the clouds, the waiting was over: everybody got stripped as quickly as possible, and ran towards the breaking waves. Getting in to the sea wasn’t anywhere near as bad as expected, although there was still a lot of screaming and shouting involved. It was cold (somebody reckoned about 13°C), but warmer than the air temperature, although you lose body heat much more quickly in moving water than in air. I reckoned the best thing to do was dive in as soon as it was deep enough, then keep swimming around to warm yourself up. The waves were quite good fun; I hope we didn’t spoil it too much for the surfers. It didn’t take long before I realised that I really was getting quite cold, and once we saw that most people were getting out of the water, we decided that we should too. This was the worst bit! I think I got colder then than I’d ever been before. I’ve never got dried and dressed so quickly, and was very glad that I’d decided to wear my slip-on Merrells rather than shoes with laces! There were still a few hardy souls jumping around in the water, and by this time the press photographers (at least, I hope they were press photographers) had come down to the water’s edge to try to get some posed photos. We wandered off in search of the car, and the luxury of its heating system. Once we were on our way, I tried to send a text to Clare to order our cooked breakfast; my hands were shaking so much, even resting them on my legs, that I could barely hold my phone, never mind hit the right keys. I think I need to see if I can improve the circulation in my hands! Despite being freezing cold at the end, it was a great experience. Similar in a way to doing the Spencer Tunick thing (obviously, as it involved taking your clothes off), but very different because it was quite informal and you weren’t being ordered around or told to stand in once place for ages. I’ll definitely do it again if it’s organised for next year, I just hope it isn’t quite so cold! Many thanks to everyone who’s sponsored me via JustGiving (or said they were going to, but haven’t quite got round to it yet). Early one Sunday morning, seven years ago, a group of people were walking around Newcastle and Gateshead Quayside without any clothes on. Nothing particularly unusual in that, you might think, but this wasn’t the tail end of a stag party that got a bit out of hand. This group consisted of about 1700 people, and I was one of them. 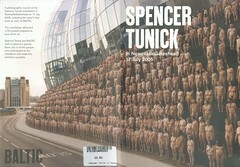 A friend and I had been “volunteered” by someone unknown to participate in the Spencer Tunick art installation for the Baltic Arts Centre, and we decided that we might as well do it anyway. It turned out to be surprisingly enjoyable, and definitely something that we’d repeat given the chance. Read more details and sponsor me here. There are few things more relaxing than spending a couple of hours in your garage, doing a task that you know how to do, you’ve done before, and you have all the right tools for. I had a new tyre put on the Falco‘s front wheel yesterday, and I needed to get it put back on so I could use the front paddock stand on the Elefant. As the front brakes had to come off anyway in order to remove the front wheel, I thought it would be a good opportunity to give them a bit of a clean before it ends up being sat around for most of the winter. Pump the pistons out a little bit, give them a good spray with brake cleaner, a scrub with an old toothbrush, and a wipe with a rag. A little smear of rubber grease around the visible part of the pistons, then push them back in. There was almost a comedy piston-falling-out moment, when I forget that one caliper had nothing stopping the pistons moving when I pushed the others back in, but fortunately I realised just in time to stop an egress of brake fluid… phew. Refitting the wheel was a bit of a pain: the design of the front spindle means that it’s easy to end up with the left fork in the wrong place, if you don’t get the spindle positioned correctly. In fact, the first time I had a new front tyre on my first Falco (R.I.P. 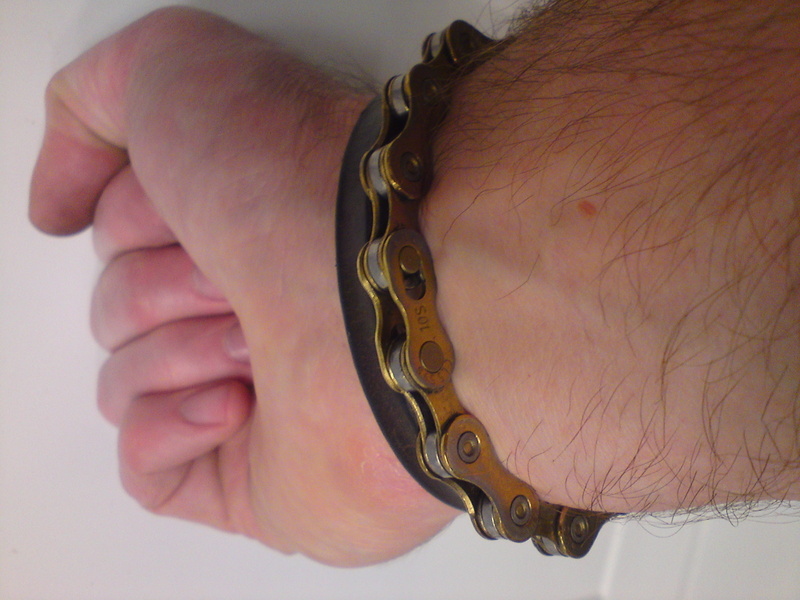 ), the fitter cocked it up to such an extent that it was hard to push the bike around, because the caliper was fouling the disk so much. Once I was happy with the position of the front wheel and spindle, the brake pads were given a fresh smear of copper grease, replaced, and everything tightened up in the correct order (or untightening, bouncing the forks, and retightening, as per the workshop manual, to make sure the forks are correctly aligned). A couple of beers whilst doing it, some decent tunes on the stereo, and I was perfectly happy. If only it wasn’t so cold; the next little job (replacing the Elefant’s speedo drive and front wheel bearings) might need thermals, as well as my padded overalls.